As we recently announced, the latest release from our partners at USAopoly, Munchkin Zombies: The Walking Dead, is now in stores. This 56-card tuckbox expansion for use with Munchkin Zombies brings the world of Skybound's The Walking Dead comic book to your game table, giving you twisted new cards like Sliced and Diced! and Bucket of Feet and new monsters including Rick and Michonne. 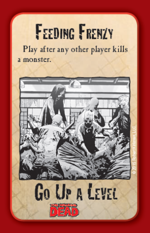 If you would like a peek at the guts of this latest Munchkin Zombies expansion, you should read USAopoly's "Behind the Scenes of Munchkin Zombies: The Walking Dead Expansion," posted at their blog. They've posted an overview of the set -- including 13 sample cards! -- to whet your appetite as you wait for your next game session. Carl and The Governor certainly look like tasty monsters . . . just watch out for your opponents playing Feeding Frenzy and horning in on your kill. Grab Munchkin Zombies: The Walking Dead at your FLGS today, or order a copy direct from Warehouse 23. Your game group will thank you.